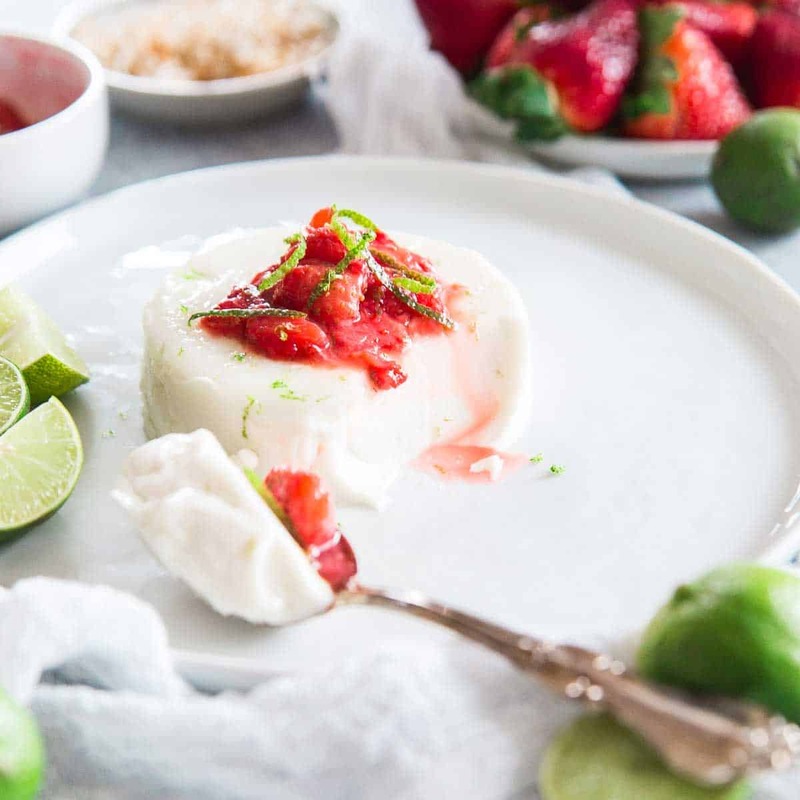 This key lime coconut panna cotta is made with coconut milk for a creamy, healthier twist to the classic recipe and topped with a key lime strawberry compote. I’ve always loved panna cotta. In fact, I love all those custardy, creamy desserts like flan (which I personally think gets an unwarranted amount of hate for some reason!) and creme brûlée. Panna cotta, however, is my favorite. Maybe I’m subconsciously partial to it because of its Italian roots? Panna cotta literally translates to “cooked cream”. How can you not love a dessert with that name? It’s creamy and smooth, takes on whatever flavor you want to throw in and out of all three of them, it’s by far the easiest to make at home yourself, no blow torches required (looking at you, creme brûlée). *This post is sponsored by In The Raw®. All content and photography is my own. That being said, before making this key lime flavored coconut panna cotta, I had never tried making it myself. I knew in theory it was easy but it was one of those recipes that still haunted me for some reason. Instead of easing into it with the classic panna cotta ingredients like heavy cream, milk and sugar, I basically decided to go big or go home with this recipe. In place of dairy, I used coconut milk and instead of sugar, I used Monk Fruit In The Raw®. Basically, it was either going to be an epic dairy-free, paleo version of panna cotta or a huge fail. Thankfully, as you can see, it was the former. Traditional panna cotta uses some combination of dairy milk and cream combined with sugar and gelatin to create a creamy dessert that holds together just well enough to keep its shape outside of the mold while still being jiggly and loose enough to keep a nice delicate texture. How Do You Make Coconut Panna Cotta? Combine milk (in this case coconut milk) with sugar (monk fruit sweetener which we’ll talk more about below) and flavorings in a sauce pot. Add bloomed (just a fancy term for combining gelatin and water) gelatin to the mixture, whisk until dissolved. Pour into ramekins, cover and chill until set. You’ll want to grease the ramekins before pouring the panna cotta mixture into them to help release the panna cotta after they’re set but that’s about it! Gelatin does all the magic work as the panna cotta sets up in the fridge. Monk fruit has been gaining popularity recently in low-carb recipes as a great alternative to sugar. Monk fruit is a small sub-tropical melon found in Asia. Because the extract is naturally extremely sweet (approximately 200-300 times sweeter than sugar), it’s commonly blended with a bulking agent to make it measurable. 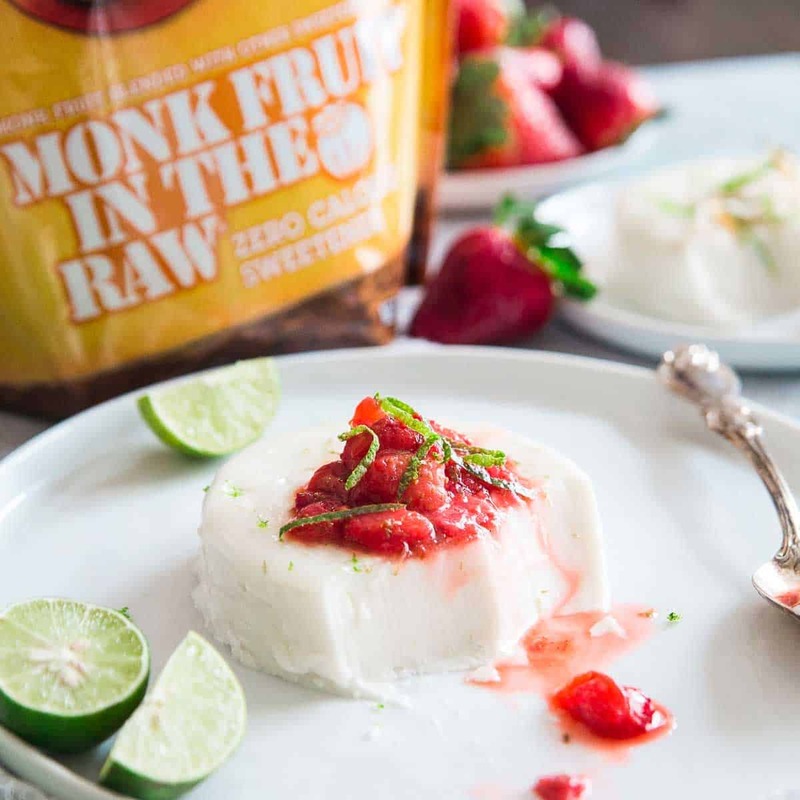 I used the Monk Fruit In The Raw® Bakers Bag in this coconut key lime panna cotta which combines monk fruit extract and maltodextrin. It measures cup for cup, just like sugar and is a great option for lower-calorie and carbohydrate sweetening. For baking recipes, it’s best to only replace up to 50% of sugar with the Monk Fruit In The Raw® as sugar still has certain properties that help baked goods rise and maintain a desirable texture. But for recipes like this coconut milk panna cotta where the “baking” is done on the stove-top, you can solely use the Monk Fruit In The Raw® making this dessert recipe a great lower calorie option when you’re craving something sweet! 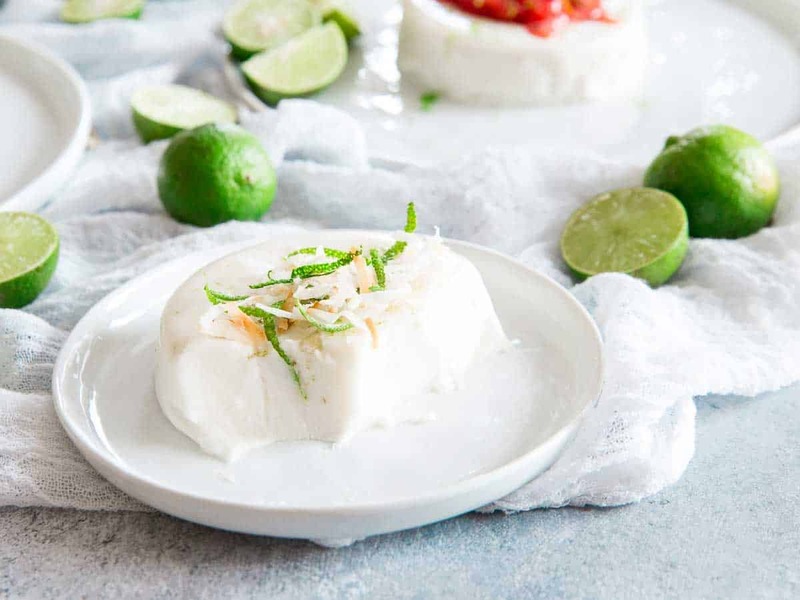 What Does This Key Lime Coconut Panna Cotta Recipe Taste Like? Imagine key lime pie and a piña colada combined. That delicious combination is exactly what this coconut panna cotta recipe tastes like. It reminds me of a decadent dessert version of this coconut lime smoothie. The texture is silky smooth and creamy. The flavor is tart and bright but balanced perfectly by the coconut cream. For toppings, fresh key lime zest is a must. 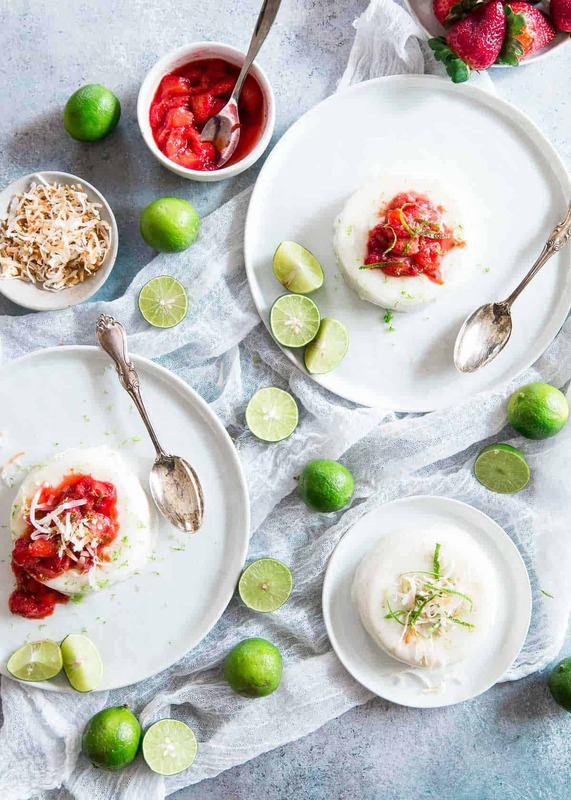 I did two variations: one with toasted coconut and key lime zest and the other with a strawberry key lime sauce/compote which you can find the directions to in the recipe below. Either option is delicious depending on what you like. From a visual standpoint, I love how the strawberry sauce pops against the pretty white coconut panna cotta. If you wanted a spicy kick, you could even try putting this strawberry chile sauce on top! Besides being lower calorie because we used Monk Fruit In The Raw® as the sweetener, using coconut milk makes this panna cotta recipe paleo and dairy free as well. Panna cotta is also naturally gluten-free. So, unless you’re vegan (although you can substitute the gelatin for agar agar to make a vegan panna cotta, I’d recommend googling vegan panna cotta for precise measurements on that though as I haven’t played around with that variation), this key lime coconut cream panna cotta has every dietary niche covered! If there’s one tricky part about panna cotta, it’s the un-molding process. Now, no one says you even have to un-mold it. If you want to be lazy (and I almost went this route but figured for my first go at it, I should do it the traditional way), just eat the panna cotta out of the ramekin and don’t bother trying to get it out. ps- you can also pour the mixture into a glass, it doesn’t have to be made in a ramekin. If you want the un-molded traditional look of panna cotta though you’ll need a small bowl filled with hot water. Simply loosen the edges of the panna cotta by running a sharp knife around the inside of the ramekin and then dip the ramekin in the hot water for 20-30 seconds. Invert the ramekin onto the serving plate and sort of gently shake/wiggle things about. You’ll hear the suction let go when the panna cotta releases. If it doesn’t release after the first dip in the hot water bath, just repeat the process again until it does. It took me 3-4 dips before mine released with a couple of the ramekins. Be patient, it will happen. Sometimes substitutions make a recipe more complicated but I truly think using coconut milk in this key lime panna cotta did just the opposite. Coconut milk keeps you from having to worry about the right balance of heavy cream and milk (as there is a certain percentage fat content that makes for the best panna cotta texture) while also opening up this dessert to a bunch of other dietary niches it normally wouldn’t fit in. Combined with the Monk Fruit In The Raw® bakers blend, the result is healthier panna cotta with all the classic elements of the traditional dessert. 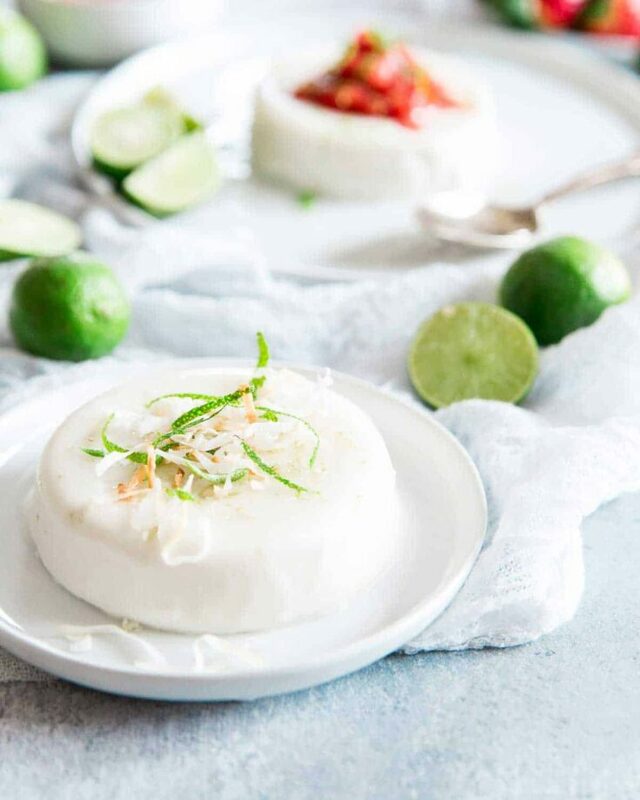 Love this paleo, dairy-free, coconut key lime panna cotta recipe? 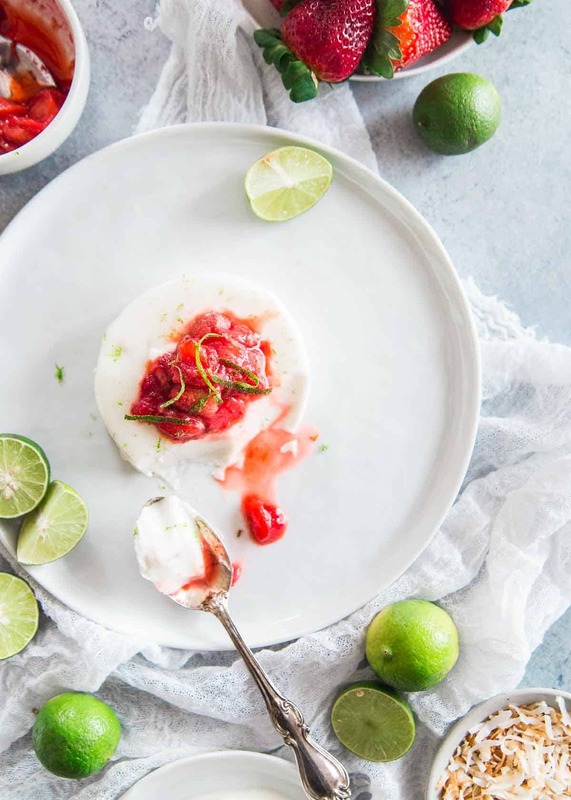 This key lime coconut panna cotta is made with coconut milk for a creamy, healthier twist to the classic recipe and topped with key lime strawberry compote. Grease 3 ramekins with coconut oil. Place cold water in a small bowl, add gelatin and set aside. While gelatin blooms, combine coconut milk, Monk Fruit In The Raw®, key lime juice, zest and vanilla in a small sauce pot over medium heat. Bring the mixture to a low simmer, stirring frequently. Once simmering, add the gelatin mixture and whisk constantly until gelatin is fully dissolved. Pour the mixture into the greased ramekins. Place the ramekins on a small baking sheet and let cool to room temperature. Once cooled, cover with plastic wrap and place in the refrigerator overnight or for at least 6 hours to set. When ready to serve, remove the ramekins from the refrigerator and fill a large bowl with hot water. Use a sharp knife to go around the edge of the ramekin and loosen the panna cotta from the sides. Place the ramekin in the hot water for 20-30 seconds. Invert the ramekin on a plate, gently tapping/wiggling until the panna cotta releases. If this doesn't work on the first try, re-dip the ramekin in the hot water for 15-20 seconds and try again. Repeat until panna cotta releases. Combine all ingredients in a small sauce pot and bring to a low simmer over medium-low heat. Let simmer until thickened and strawberries start to break down. Spoon over plated panna cotta before serving. Try these additional toppings: toasted coconut flakes, whipped coconut cream, chopped toasted cashews. This Key Lime Coconut Panna Cotta is such an elegant dessert! This would be perfect for entertaining or even enjoying by yourself. Love it!